This is the far wall of Oscar's Super Service. Restrooms and telephones are here. 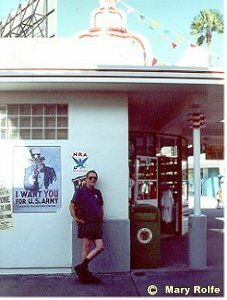 "NATIONAL INDUSTRIAL RECOVERY ACT [NIRA]: 1933 -- created NATIONAL RECOVERY ADMINISTRATION [NRA], which administered process for devising industry-wide codes of fair business practices. NRA's symbol was a blue eagle, slogan -- "We Do Our Part." The NIRA's � recognized the right of labor to bargain collectively for working hours, wages, and conditions. The NRA was declared unconstitutional by the Supreme Court in 1935 [Schechter Poultry Corp. v. United States] -- but � (the Wagner Act) survived constitutional challenge. "The WAGNER ACT created NATIONAL LABOR RELATIONS BOARD [NLRB] which reaffirmed labor's rights to bargain for wages, hours, and working conditions, to strike, and to arbitration of grievances." What little I've been able to find to read about NRA says it was canned in 1936 but a couple of people are telling me they remember signs from the mid to late 40s. Do you know anything about this? If so, care to share?